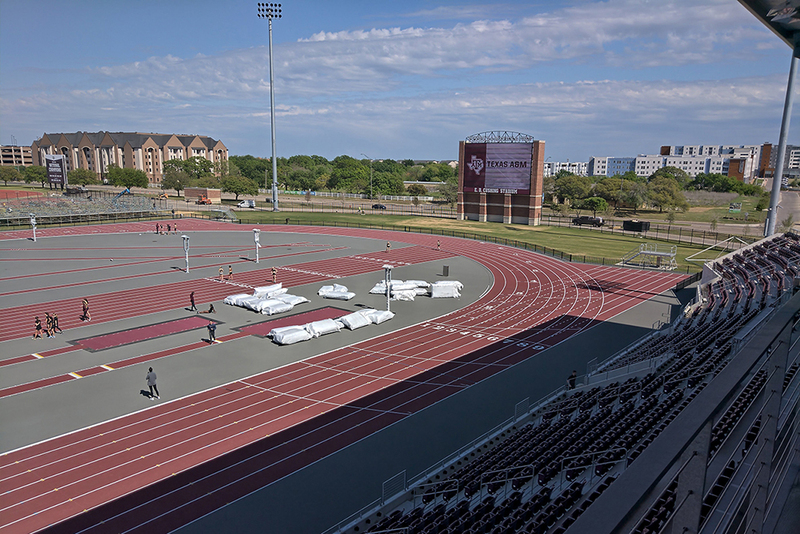 Texas A&M’s new state-of-the-art facility features a rare placement of the straightaway in the center of the infield. Visiting teams from Baylor, Clemson, Illinois, Oklahoma, Texas and Texas Tech—plus the Arkansas women—should make the competition in the team-scoring meet stiff. Texas Tech will bring its powerful field events squad, headlined by NCAA discus leader Duke Kicinski. “We’re cranking it up a little bit more each week,” says Tech coach Wes Kittley. Iowa’s Mar’yea Harris (fresh off his 44.61 anchor at the Florida Relays) highlight’s the 400. Oregon’s Makenzie Dunmore and Cravon Gillespie will be in the 100s. Alexa Efraimson, last seen placing fifth in the Fifth Avenue Mile, will open up her season in the 1500. The men will run the mile, and the top seed is Oregon senior James West, who has a 1500 best of 3:36.59. After she missed all of ’18, former World Indoor champ Chanelle Price is plotting her return to the 800. Maggie Ewen and Beatrice Llano will highlight the hammer. USATF Indoor champ Chase Ealey will throw the shot, but with no Ewen in that event. 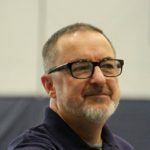 Georgia’s annual get-together will feature Mississippi, South Carolina and Virginia Tech, among others. Quincy Hall of South Carolina, the ’17 Pan-Am gold medalist, will open up in 400H. Last year his season ended with injury in May, so he didn’t get to show off his 44.60/49.02 skills at nationals. This being Athens, Georgia, expect some good multis. 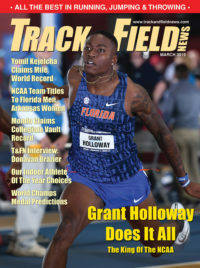 USATF Indoor champ Kendell Williams headlines the women’s field while Estonians Karl Saluri, Johannes Erm and Karel Tilga—8000-pointers all—will battle in the decathlon. Denzel Comenentia will be in the discus, and the Gamecocks’ Aliyah Abrams in the 400. LSU may provide some of its own fireworks in Baton Rouge. This is the meet where last year the Bengal women ran a world-leading 42.50 in the 4×1. Mississippi State’s Curtis Thompson, the ’16 NCAA javelin champ, will be competing a week after his 3rd place at the Texas Relays. Last year’s USATF heptathlon champ, Erica Bougard, will be competing in three jumps (high, long and triple) as well as the 100 hurdles. Arizona’s big invitational will feature Minnesota, Oklahoma State, Purdue, TCU and USC. Shot putter Jordan Geist will open his outdoor season. Minnesota’s Temi Ogunrinde will compete in the hammer. The high jump will see USC’s Earnie Sears. The Trojans will be loading up the 200 with defending NCAA champ Angie Annelus, Twanisha Terry and others. Terry will have earlier run the 100. Another big Trojan presence will come in the 100H, with sub-13 performers Chanel Brissett, Dior Hall and Mecca McGlaston. The annual Southern California prep extravaganza is also set for this weekend. Last year, some 27 boys broke the 9:00 barrier in the 3200. Meet organizers say we might see something similar this time around. Matt Strangio (Jesuit, Carmichael, California) leads the nation at 8:47.97. He will be facing last year’s mile champion from Colorado, Cruz Culpepper (Niwot), who is moving up. The girls distances should be just as exciting, with Illinois prep Katelynne Hart (Glenbard West, Glen Ellyn) reportedly chasing the 3200 meet record of 9:55.92. In the 300 hurdles, we’ll see multi star Anna Hall (Valor, Highlands Ranch, Colorado). Relay powerhouse Bullis (Potomac, Maryland) will be coming from the other coast. In the distance relays, expect great races between American Fork (Utah) and Great Oak (Temecula, California). The pole vault will feature new indoor HSR-holder Chloe Cunliffe (West Seattle). The girls throws look exceptionally deep, with the top 5 putters in the nation. Our guide to major-meet results links is here.